Original Editors - Jessica King & Melissa Tuemler from Bellarmine University's Pathophysiology of Complex Patient Problems project. A Myocardial Infarction (MI) occurs when an area of the heart does not receive enough blood flow and is subsequently damaged or dies. An MI is commonly referred to as a heart attack and is always a medical emergency. Many times an MI occurs when one of the main arteries to the heart, specifically the coronary arteries, become blocked due a build up of plaque. Plaque build up occurs when cholesterol and other large cells attach to the arterial walls, and cause narrowing of the arterial canals. When the arteries becomes increasingly narrow due to plaque build up there is no longer adequate blood and oxygen control to the heart, and an MI occurs. Often times an MI can occur suddenly, and without warning signs. Some identified causes of an MI include sudden physical exertion, recent illness, and emotional stress. Myocardial Infarctions are the leading cause of death in the industrialized nations of the world. In the United States, there are about 450,000 deaths due to MIs each year. Now 95% of patients hospitalized with an MI will survive due to improvements in emergency response time, and treatment techniques. The risk of having an MI increases with age, but 50% of MIs in the United States occur in people under the age of 65 years old. Signs and symptoms vary based on gender. The most common symptom experienced by both genders is chest pain or discomfort. Women typically experience other symptoms such as SOA, nausea and vomiting, and neck or jaw pain. Following an MI, patients will most likely be prescribed some form of medication for the rest of their lives. Blood thinner. Decreases clotting ability of the blood, but do not dissolve existing clots. Prevent angiotension II from having any effects on the heart and blood vessels. This keeps blood pressure from rising. Various medications can lower blood cholesterol levels. They may be prescribed individually or in combination with other drugs. They work in the body in different ways. Some affect the liver, some work in the intestines and some interrupt the formation of cholesterol from circulating in the blood. Diagnostic tests for determining if a patient has had an MI can be invasive or non-invasive. 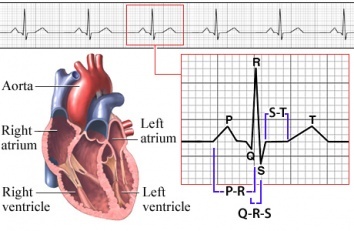 EKG: records the electrical activity of the heart. Ambulatory EKG and Holter Monitoring: records the electrical activity of the heart during ADL’s. Chest X-ray: photograph of the heart and lungs that helps determine if the heart is enlarged or if fluid is accumulating in the lungs. Echocardiogram: hand held device placed over the chest that uses ultrasound to produce images of the heart. Exercise Stress Test: monitor with electrodes that are attached to chest and monitor the heart response while an individual walks on a treadmill. Cardiac Catheterization: examines the inside of the heart and blood vessels using an angiogram and dye. This can measure the blood pressure in side the heart, detect where a narrowing in the vessel is located, and evaluates overall heart function. Heart disease has many risk factors, some that can be changed and others that cannot. Damage to the heart can lead to some serious effects on the cardiovascular system including decreased peripheral blood flow, dangerous heart arrhythmias, congestive heart failure, and an increased risk for another MI. The pulmonary system is also affected by an MI because there is a decreased level of oxygen saturation due to the damaged heart. Often times during an MI fluid can accumulate in the lungs which could result in damage or infection. Many times during an MI the insulin levels spike in individuals, even if they do not have diabetes. Treatment to control the increase in insulin is often required. Often times these individuals need to undergo emergency heart surgery, and the incisions need to be monitored for infection. Thrombolysis: procedure typically administered within 3-4 hours of an MI. A clot-dissolving agent is injected into a coronary atery to restore normal blood flow. Angioplasty: This procedure greatly increases blood flow through a blocked artery. A balloon is threaded into the blocked artery and is inflated to expand the blocked area so blood flow can be restored. A stent is also commonly placed into the blocked artery during this procedure to ensure that a blockage does not happen again. Artificial Heart Valve Surgery: procedure replaces unhealthy or deceased heart valves with new, healthy ones. Atherectomy: a catheter is threaded through a blocked artery. The catheter has a rotating sharp end that is used to cut away at plaque formation in the wall of an artery. Bypass Surgery: one of the most common treatment strategies for managing blocked arteries. 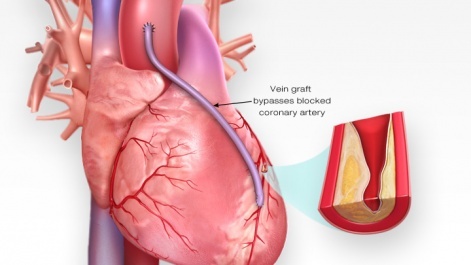 New passageways are created by using grafts from veins or arteries from other areas of the body to pass the blocked site so blood can flow freely. Cardiomyoplasty: currently an experimental treatment where skeletal muscles are wrapped around the patient body over a weak heart. This will improve the heart's pumping motion when stimulated byb a pacemaker type of device. Heart transplant: removal of a diseased heart that is replaced by a human heart from a donor. Radiofrequency Ablation: A catheter with an electrode at its tip is guided through the veins to the heart muscle with real-time, moving X-rays displayed on a video screen. The catheter is placed at the exact site inside the heart where cells give off the electrical signals that stimulate the abnormal heart rhythm. Then a mild, painless radiofrequency energy is transmitted to the pathway that carefully destroys selected heart muscle cells in a very small area (about 1/5 of an inch). Stent placement: a wire mesh used to hold open an artery during an angioplasty and is then permanently placed in the artery. Transmyocardial Revascularization: used to relieve very severe chest pain or angina in patients who are not candidates for a bypass. Left Ventricular Assist Device: battery operated, mechanical pump device that is surgically implanted into the heart and is used to maintain the pumping ability of a heart that can't effectively work on its own. This device is typically implanted in patients who are on the waiting list for a heart transplant or suffering from end-stage heart failure. Pacemaker: device implanted into heart tissue that sends electrical impulses to help maintain a regular heart beat. This device is typically used when the hearts "natural pacemaker" becomes defective and causes the heart to beat at an irregular beat. Implantable Cardioverter Defibrillator: a device that is implanted into the heart that can send an electrical shock, detect heart rhythm, and at times pace the hearts rhythm. Cardiac Rehab may be beneficial to patients of all ages who have had a heart attack, CAD, angina, or CHF. Other individuals who may gain benefits from this include post- surgical CABG, percutaneous intervention (PCI), or coronary angioplasty patients. A medical examination is completed at the initial consultation to determine the needs and limitations of the patient. After the results of the exam are interpreted, the team creates a rehab program and sets goals for treatment. Treatment typically consists of a physical activity program in a group setting where vital signs can consistently be monitored. As the program progresses, the patient is taught how to monitor their own vitals and progresses to more challenging aerobic activities. Along with physical activity, patient education is also a very important part of cardiac rehab. Patients may work with a dietician or be given advice on how to stop smoking if necessary. There are alternative/holistic options that can be employed to prevent an MI or additional MIs, which focus around diet and exercise. Regular aerobic exercise can help decrease an individual’s risk for an MI, and promote better overall health and wellness. Meditation and Yoga are two other options that can help cardiac patients recover after an MI and reduce stress that could lead to another MI in the future. Nutrition is an important factor in reducing an individual’s risk for an MI. 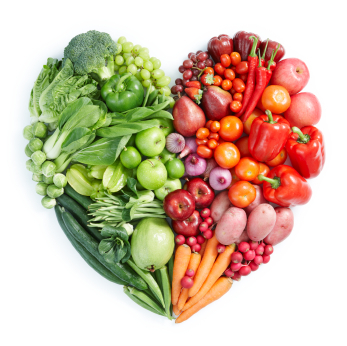 A diet low in fatty acids and cholesterol is important to limit the plaque buildup within arteries. There are many differential diagnoses for patients experiencing an MI, and because there are many distractions an MI can often be missed. All patients that present with symptoms concurrent with an MI should be treated as a medical emergency. Chernyavskiy A, Marchenko A, Lomivorotov V, Doronin D, Alsov S, Nesmachnyy A. Left Ventricular Assist Device Implantation. Texas Heart Institute Journal. (2012, Oct), cited February 15, 2013; 39(5): 627-629. Available from: Academic Search Premier. Marcuccilli L, Casida J. Overcoming alterations in body image imposed by the left ventricular assist device: a case report. Progress In Transplantation (Aliso Viejo, Calif.). (2012, June), cited February 15, 2013; 22(2): 212-216. Available from: MEDLINE. Narasimhan S, Krim N, Silverman G, Monrad E. Simultaneous Very Late Stent Thrombosis in Multiple Coronary Arteries. Texas Heart Institute Journal. (2012, Oct), cited February 15, 2013; 39(5): 630-634. Available from: Academic Search Premier. ↑ 1.0 1.1 MedlinePlus. Heart Attack. http://www.nlm.nih.gov/medlineplus/ency/article/000195.htm (accessed 10 Feb 2013). ↑ 3.0 3.1 American Heart Association. Warning signs of a Heart Attack. http://www.heart.org/HEARTORG/Conditions/HeartAttack/WarningSignsofaHeartAttack/Warning-Signs-of-a-Heart-Attack_UCM_002039_Article.jsp (accessed 10 Feb 2013). ↑ American Heart Association. Cardiac Medications. http://www.heart.org/HEARTORG/Conditions/HeartAttack/PreventionTreatmentofHeartAttack/Cardiac-Medications_UCM_303937_Article.jsp (accessed 11 Feb 2013). ↑ American Heart Association. Symptoms and Diagnosis of Heart Attack. http://www.heart.org/HEARTORG/Conditions/HeartAttack/SymptomsDiagnosisofHeartAttack/Symptoms-and-Diagnosis-of-Heart-Attack_UCM_002041_Article.jsp (accessed 10 Feb 2013). ↑ Beautiful. 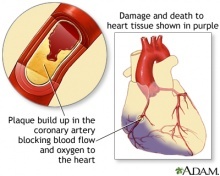 About Coronary Artery Disease. http://www.beautiful-study.com/static/html/general/about_coronary.asp (accessed 15 Feb 2013). ↑ American Heart Association. Cardiac Procedures and Surgeries. http://www.heart.org/HEARTORG/Conditions/HeartAttack/PreventionTreatmentofHeartAttack/Cardiac-Procedures-and-Surgeries_UCM_303939_Article.jsp (accessed 11 Feb 2013). ↑ American Heart Association.What is Cardiac Rehab? http://www.heart.org/HEARTORG/Conditions/More/CardiacRehab/What-is-Cardiac-Rehabilitation_UCM_307049_Article.jsp (accessed 11 Feb 2013). ↑ Medscape. Myocardial Infarction Differential Diagnosis. http://emedicine.medscape.com/article/155919-differential (accessed 14 Feb 2013).